As the Philippines prepares for another typhoon, can we really say we've done everything we can to prevent another catastrophe? 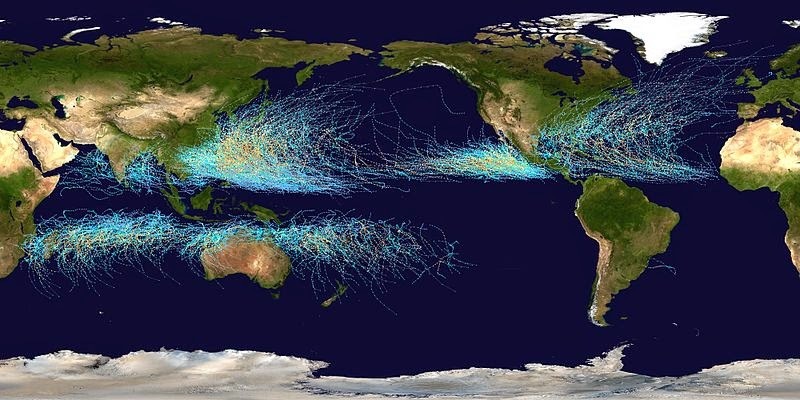 A map of all tropical cyclone tracks, encompassing the period between the years 1985 and 2005. Five of the Top 10 deadliest typhoons in the Philippines arrived in the last 2 decades. And all of the top 10 most destructive (in terms of US dollars damage) occurred in the last 4 decades – that means most of Pinoys have seen at least one. Me and my family were right smack in the middle of 2009’s Ondoy tragedy. The last major typhoon was famously one of the strongest that has ever made landfall. Typhoon Haiyan (local name Yolanda) left more than 6000 people dead and over $2 billion in damages. Does that sound normal to you? I'm afraid that if we say it often enough, it does become normal, and any typhoon that goes through the Philippines and kills less that 6000 people becomes a "minor event" in our books. Zero deaths from typhoons in the Philippines. That’s what we want. But what can we do to get there? I urge the Philippine government to realise the potential cost of another catastrophic typhoon. Foremost, it is the right thing to do, to save our countrymen from the pain of losing family to another Yolanda. Secondly, it is the economic burden that each typhoon brings - losses in farming, manufacturing, destruction of infrastructure. And thirdly, remember to consider the cost of losing present and future investors. How can we attract long term investors if we are constantly at risk of disrupting businesses and disrupting production? I urge all Filipinos to VOTE in 2016 for candidates with a concrete mission to address our long term protection against these major typhoons and other catastrophes. Why? Because we can't stop these typhoons from coming, not in the short term. So we need to be prepared to face them and survive them. And we need the government's support to make things happen. I urge all Filipinos to educate yourselves on how to survive a typhoon - what to have in your house for emergency purposes, where to go inside your house and how to get out of your house in case you need to. Have that conversation with your parents, your children, your grandparents, your family and friends: What should we do and where should we go in case of an emergency. It's not going to be easy, but I am hopeful we will get there. At this point, we don't really have much of a choice.